You know what’s funny about school shootings? It’s the only time the public still universally loves teachers. We don’t trust them with collective bargaining rights. We don’t think they deserve a decent salary. Heck! We don’t even trust their judgement to design their own teaching standards, lead their own classrooms or be evaluated by their own principals! But when armed assailants show up at school, then we think teachers are just great. When angry teens arrive rifles strapped to their trench-coated backs, carrying duffel bags full of ammunition – then teachers are heroes. I guess you can’t standardize your way past a bullet. My school district had an outstanding training today. 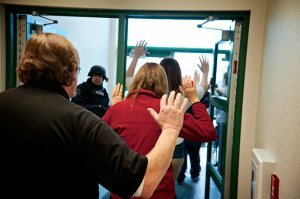 Administration brought in current and retired FBI agents, local law enforcement and EMTs to practice active shooter drills with the teachers.